On Thursday, we played our first round of the Minor League Cup away at Spinney Hill. We won the toss and opted to play white on the odd-numbered boards. Owing to the handicap system, we started with a one point advantage (because of some dodgy arithmetic, at the time, we thought this was one and a half points). The first result was a loss for Michael against Alan Butler, this was followed by a victory for Ray against Rich Davis. Pete had looked strong for a long time against John Colver with connected queenside passed pawns provoking his opponent into some desparate tactics leading to a win for Pete. Much the same then happened on my board except that it was my opponent with the connected passed pawns and i was slowly, but surely losing. My beautiful, but fatally flawed, queen sacrifice failed to come off (although it did result in Mick looking fairly horrified for a moment). Including the bonus, the final score ended 3-2 to us. HA1: Tuesday 2nd November at home against Braunstone 1. Tuesday 9th November at home against Wigston 2. HA2: Wednesday 10th November away against Melton Mowbray 3. HA3: Tuesday 2nd November at home against Red Admiral 2. Thursday 11th November away against Kirby Muxloe 2. We probably should have done better. Mike was 2 pawns up in double rook ending but got caught in a mating threat and had to take a repetition, and I was exchange and pawn up but ran out of time so also had to take a repetition. At home against Braunstone next week, we may be facing Mark Hebden. On Thursday, the Minor section of the County Championships was decided. Guy Closs, Dennis Wilkins, and, our own, Ray Beach had all scored 4 points from the six rounds. On Thursday they were meeting, over the space of one evening, to sort out who would be Champion. We all met at Wigston Chess Club. Dennis said he was not happy with quick play . We all spun a coin and I was the odd one out. Guy and Dennis spun again Guy played white and lost to Dennis. I then played Guy, with Guy having black, and I lost. Dennis now just needed to beat me to become champion, but guess what, I won with black. Result: we have all played 2 and won 1. Down to the bar - Dennis says he does not want to play any more chess and withdraws. Guy and I decide to play a quick play - 10 minute game. Dennis spun the coin for us and I won the toss so chose to play white. Dennis stood and watched and I won the event of the evening, therefore making me the Minor County Champion. Congratulations to Ray on this well deserved title. This marks the end of a phenomenal summer for the club and its members. This week has been set aside for League Cup matches. HA1 will be playing at home against Scraptoft Valley on Tuesday, and a merged HA2/HA3 side will be playing away at Spinney Hill on Thursday. The chances of a club night on Tuesday are fairly good. As you probably know 2010 is the 150th anniversary of the founding of the County Chess Association, and the Policy Committee have agreed to hold an event to celebrate this important date. Please let Colin Ross know if you would like to play. Places are limited now, so please let him know sooner rather than later to secure your place. On Tuesday, both HA3 and HA1 were playing at home. Brian Martin played his first competitive game for the club – welcome Brian. HA3 played all new players against the very experienced Braunstone 4 side. As with last week, all the boards looked about equal until at least 8PM. The first result came on the top board where Brian, with the black pieces, had advanced both his g and h pawns one square. First, Guy’s bishop came crashing through taking the h-pawn, this was followed by a full scale assault on black’s kingside. Faced with the inevitable, Brian resigned. Gary and Drew were both material down to their opponents and lost within a few seconds of each other. Michael’s game was the last to finish. Michael had held the initiative early on and for a good while he had looked good for the point, but it slipped away. All four of our players will be winning games before very long. HA1 played a very strong Melton 1. Rajan won by default when his opponent did not arrive. Dave B (168), with the black pieces, had come within a whisker of beating Graham Lee (203), but lost on time. Black to move - but with only seven seconds on the clock. The match eventually finished with a narrow 2-3 loss. 2 W 167 Ganger, Rajan 1 - 0 **DEFAULT** ? HA1 (HA1 in the League Cup is the same as HA1 in the League) at home against Scraptoft Valley 1 on Tuesday 26th October. HA2 (HA2 in the League Cup is comprised of players from the League HA2 and HA3 teams) away against Spinney Hill on Thursday 28th October. Wednesday 10th November away against Melton 3. If you want to join us let us know. Tough that's all I've got to say ! We outgraded them by miles . Rajan was comfortable , I was a pawn down but solid . John was mashing his opponent and so was my aged relative . Alan duly won ( well done uncle !! ) . Yes it was all going so well ! Raj then succumbed to a perpetual . John imploded , he warned me this might happen and boy did it ( Poor John it was painful to watch ) and so it was left to yours truly , still a pawn down but needing a draw just to save face . Then he decided to swap pieces and let my king in . Joy !! 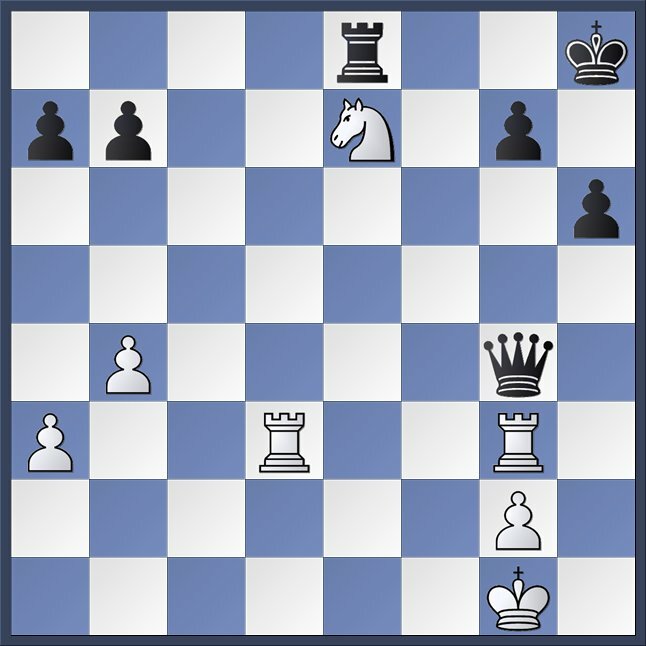 Faced with the prospect of either being mated or dropping a piece, white resigned. In my game, I thought that it would be a good idea to get my Queen trapped and have to exchange it off for a rook. Later, I very cheekily suggested a draw to my opponent only to have him accept – rrrrresult. Gary, Drew and Michael all put up a good fight, but succumbed in the end. Opening moves had looked good, and there was material parity for quite a while. Ray had been looking good against Judith, but the game ground down to a draw. A great result for Dave B. With the score at 2-2, Mike Cowley entered a time scramble against Greg Eagleton, and although it appeared to have gone wrong, Greg’s flag fell first. One match out of one. Pete is still trying to raise a team for Thursday away at Ashby. HA1 and HA3 will be back at the Heathcote next Tuesday. I was not there on Thursday, but i hear that there was a mix up with the presentation of the Cups. Whilst the winners of the Chapman and Harrod Cups were announced, i am told that, there was no mention of the Heathcote Arms winning the Wylie or the Birstall Cups and no mention of Rob becoming County Champion. Sean, apparently had to go up and retrieve the silverware manually. There was also some confusion about why we had received six Division 5 winners medals - i had asked for two extras so that all the HA2 squad would get one - we will still have to pay for these. According to the LRCA website, there were 16 teams of 4 in the Charity Quickplay competition and £150 was raised for the Air Ambulance. I am sorry i missed the quickplay as this is a really fun event. Ray probably doesn't realise it yet, but he has won a £15 grading prize for his performance in the Atkins. Rajan played his socks off, in the Open, and took a £50 grading prize. Best performance of all though was from Graham B who came joint first in the Major. Scores for club players were: Rajan 3 (finishing 14th in the whole competition), Graham 4, Rob 1.5, Ray 2.5, Colin 2.5. From the Red Admiral: Andy and Amber C scored 2.5, and 2, respectively. Unsurprisingly, Mark Hebden won the Open with 5/5. A tremendous finale to a great season for the club. Tomorrow night, we start again.